The Scandinavia Church was closed in 1959 and later demolished. The Centennial Committee together with the village and Municipal councils have jointly moved the Lutheran Church Manse to the Centennial grounds in Erickson. This all log building, one of the oldest in Manitoba and perhaps one of the last in existence is made completely of hand hewn logs. The whole structure is completely free of nails and was built during the winter of 1897-98 by all voluntary labour. All the corners are dovetailed together even the dividing walls are made of logs, something seldom seen in later buildings. Except for one log in the bottom of the building was as sound as when it was built. 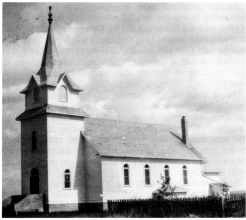 The first minister to occupy it was Pastor O. Berg who until it was completed commuted between Minnedosa and Scandinavia every Sunday for services. At that time being strictly a Scandinavian settlement all services were conducted in the Swedish language and it was until later years that as the population changed that services were given in English. Some of the old-timers who helped it were Eric Nystrom, Eric Bolin and Peter Johnson from Sec 6 and his neighbor Gust Anderson. In the spring of 1898, when C.A.V. Johnsons' arrived from Minnedosa, their father Amos Johnson spent a lot of time in helping to finish the building. Bethlehem Lutheran Church Manse - Scandinavia 1905, Pastor Rosenthal and Family. Part of the Manse was moved to the Centennial Grounds in Erickson, 1967. As the church has been torn down during the past two years the Cent. Comm. decided to bring the building (manse) into the Village and preserve it for future generations to be able to see some of the work which was done by hand by our forefathers. At this point in time in 1984, a few articles have been collected in the hopes that some day there will be a museum to be proud to have people visit. At the annual meeting of the Bethlehem Lutheran Church at Scandinavia in January 1915, it was decided that the congregation should build a church in Erickson. The work began immediately and during the 25th An­ niversary celebrations at the Scandinavia Church in 1916, the cornerstone was laid by Dr. L.P. Bergstrom, Supt. of the Canadian Mission Field, and assisted by Pastor V.J. Tengwald and Student John Bildt. The building was completed the following year and the Canadian Con­ ference of the Lutheran Church Augustana Synod was held in Erickson March 30 - April 9 with nine pastors and eighteen delegates attending. The Canadian Conference met again in Erickson in 1926 and in 1949. Not until 1921 was the Church dedicated by Dr. G.A. Brandelle, Pres. of the Synod, with Dr. L.P. Bergstrom assisting. In 1922, Mr. R. Odelberg arrived and served the congregations faithfully through the hardships of the 30's and confirmed nearly one hundred children. He served until 1940 and it was near the close of his ministry, in 1938, that the Erickson Church was moved from its lot near the highway to a site near its present location.